What is the Ad Marketplace, and how do I use it? What is the Ad Marketplace? The ad marketplace is a place where Pro podcasters can choose to post their shows as options for podcast advertisers. Advertisers see the shows posted there and choose which shows to sponsor based on the profiles posted for each show. How do I put my show on the Ad Marketplace? If you are a Pro user, all you need to do is choose "This Podcast is available in the marketplace" either in your show's edit page, or when creating a new podcast. 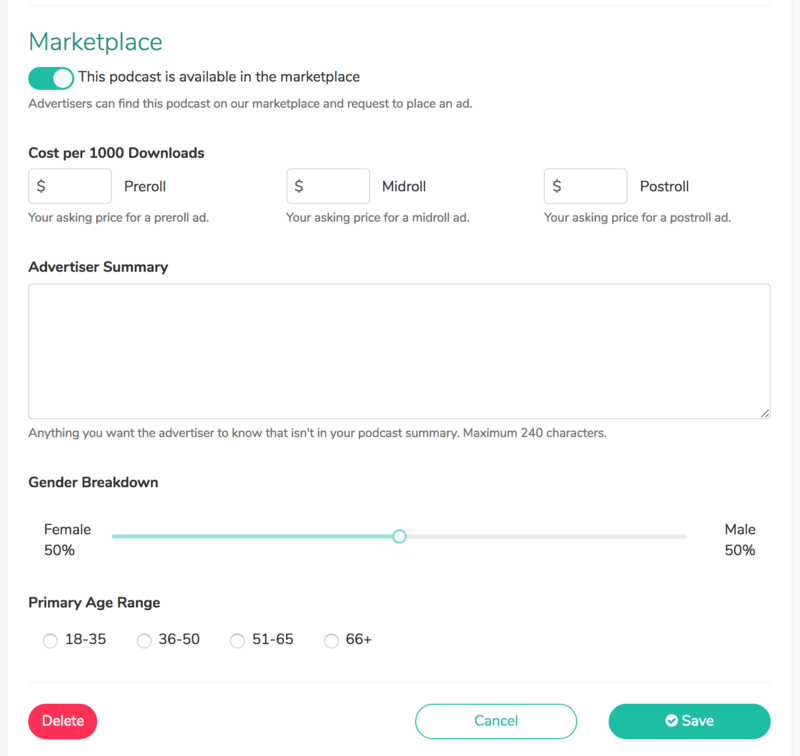 You then enter the required information, including your desired advertisement pricing, any additional information you want advertisers to know that is not already listed in your podcast summary, and the gender and age range breakdown of your audience. Click save, and you're done! Your show is up on the advertiser marketplace. How will I know if an advertiser is interested? If a bid is made for advertising time on your podcast, we will notify you. You will then have the choice of whether or not to accept the offer for sponsorship. We will never force you to accept any advertisement offer, and we will never put any advertisement into your show without your express permission. Please note: Posting your show on the advertiser marketplace does not guarantee that your show will be chosen by advertisers.